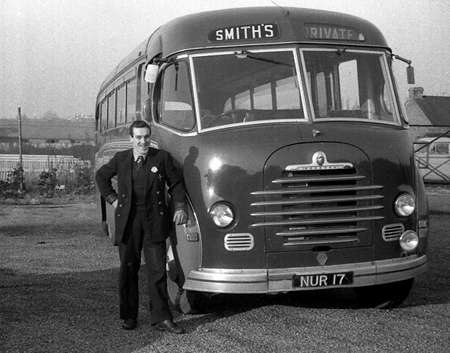 Quite awhile ago on the ‘Q&As’ page there was a question titled ‘Ex Rhondda Regents’ which questioned the number of AEC Regents that joined the fleet of Smiths Luxury Coaches from the Rhondda. The question was answered but as usual the thread took on a different direction as to whether they had an AEC or Crossley gearbox, this resulted in the contribution by David Beilby of the above vehicle. David also provided the following copy, NTG 137 was formerly Rhondda 284 and is seen here in April 1968. The hidden connection to the ‘ex Rhondda Regents’ question is that it was working the somewhat ill-fated Crossley Omnibus Society Grand Southern tour over the Easter Weekend. Ill-fated as the Society’s ex-Oldham Crossley 368, which was due to work the first leg from Manchester to Reading, had a differential failure at Stone in Staffordshire (the upside of that is that it was fitted with a reconditioned differential afterwards by Oldham Corporation). I wasn’t on the tour but Stan Fitton, the Secretary of the Society and tour organiser, was and this photo is one of his taken on this fascinating tour which involved visits to the Bournemouth and Reading trolleybus systems and Provincial (Gosport and Fareham) NTG 137 provided the transport for most of the tour. If anyone can tell me where this photograph was taken I would be very grateful as I’ve no idea. The fairground ride in the background may provide a clue and I think it’s safe to assume the bus didn’t reach this location through the arched bridge behind. Unfortunately in the strip of negatives containing the above shot the previous photo is of Oldham 368 at Manchester Victoria and the one after is in Weymouth. So it’s somewhere between Manchester and Weymouth! Well that narrows it down a bit David. The ‘Ex Rhondda Regents’ question can be read here. I can shed no light on the mystery location, but NTG 137 brings back memories. My original question was poorly worded: I probably gave the impression that both the ex-South Wales Regent Vs and the ex-Rhondda Regent IIIs were spongy to drive. The Vs WERE, but the IIIs were nice and crisp. I’m also grateful for the clarifications about Crossley’s role in AEC gearbox design and production. 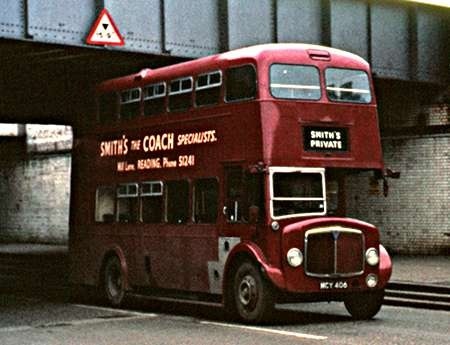 I started at Smiths in 1968 aged 15 as an apprentice coachbuilder and left in 1978. I have many happy memories of my time there in particular the many characters that worked there. Alf Smith the Guvnor as we had to call him was a true gent, he lent me 20 quid from his wallet to buy a Lambretta which I had to pay back at 10 bob a week. I would love to hear from anybody else that worked there. Barry, I left Smiths in 68, so we may or may not have overlapped, but I’m equally keen to meet other ex-Smiths folk. You’re right about the Guvnor: until you got to know him he seemed a bit remote in his smart clothes, sweeping into the yard in his Jaguar, but he was really a very kind, decent man. 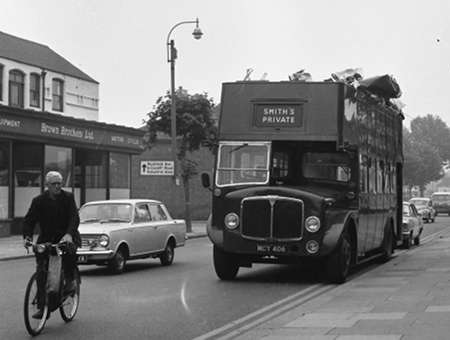 A pal of mine is scanning hundreds of photos he took in the 50s and 60s, including many of Smiths Coaches. What we haven’t got are pictures of the characters, in all their variety! I was on that ‘ill-fated’ tour but it was a long time ago and the old memory ain’t what it was. As I recall, after we broke down at Stone we had a long wait until a very comfortable coach arrived from Reading. This got us to Reading in the wee small hours and we changed onto the Regent III. All I can remember is that it was damned cold and I couldn’t sleep – unlike some! I don’t think we stopped again until we got to Weymouth, where we stopped for brekky. After that the stops (as I recall) were Gosport and Fareham, Portsmouth Corporation and Bournemouth, where we had a somewhat shortened trolleybus ride to that originally planned. Then it was back to Reading, where Stan Fitton canvassed b&b places, starting off with us youngsters, and had the job of convincing sundry landladies were were not Aldermaston Marchers. I think some of the oldsters had to kip on benches in Reading pubs, but again, memory fades. So I guess the answer is likely to be Weymouth or Bournemouth, but I honestly don’t know. The location is the old Westham Coach Park in Weymouth, as confrimed by the ‘Wild Mouse’ in the background, and by my wife, who grew up just along from the coach park in Abbotsbury Road, and as a girl used to cut through it. I read with great interest Frank and Derrick’s notes on the Dennises run by Prestwells of Woodhouse Eaves. 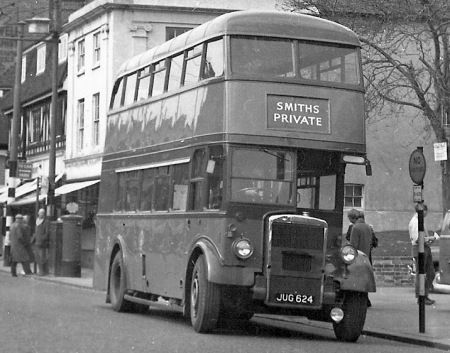 Unfortunately I’ve no info that might help, but here’s a Dennis Lancet J3 of about 1950 run by Smith’s of Reading until about 1964. The photo is by Graham Low, who incidentally contributed many of the illustrations to Paul Lacey’s book "Thames Valley 1946-1960". Having always found buses more interesting than coaches I regrettably never noted the registrations of Smith’s Lancets, many of which had been bought in from other operators. 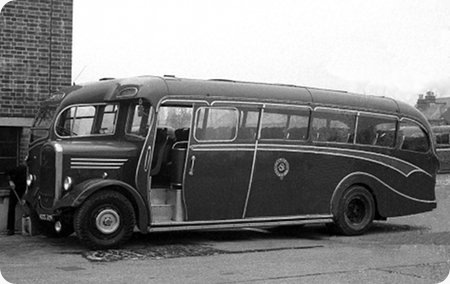 By the mid sixties they were relegated to occasional contract duties, their place in the front shed having been usurped by nice AEC Reliances and horrible Super Vega-bodied Bedford SBs. For single-deck runs on the AWRE Aldermaston contract the office would say "Take one of the spare Bedfords" but I occasionally managed to persuade them to let me take a Lancet, and what a pleasure it always was!—though the other younger drivers didn’t agree. In Classic Bus Aug-Sept 1999 there’s an amusing account of the challenges posed by the Dennis Lancet. You don’t sit over the pedals, but more behind them as in a car. The bonnet is admittedly high, but visibility is still good. First and second gears are to the right, third and fourth to the left, and for fifth leave the lever in fourth position but push it left towards the engine against a stiffish spring and then forward. Ease off the throttle and as the revs die back fifth engages itself noiselessly, and to return to fourth release the throttle for a moment, give her 44% more revs and again the take-up is smooth and silent. In contrast to this luxury the rest of the box (sliding mesh for all except fourth) is fairly unforgiving. The Dennis O6 engine, direct-injection with 4 valves per cylinder, is quiet, practically vibration-less and very free-revving, but not a low-revs slogger, so hill-start clutch control can be tricky. The steering seems rather low-geared, but is light, extremely positive and—unlike that of some AEC Reliances—dead stable. The brakes are perfectly adequate. The whole vehicle inspires confidence in the driver, and I don’t think the passengers ever complained either. 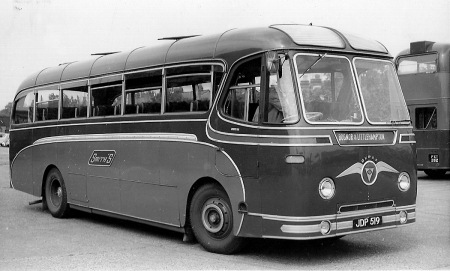 It’s interesting that Dennis were never mainstream but always managed to have a mainstream following – even in the ’50s. Considerable numbers of Lancet IIIs had full and productive lives with Yorkshire Traction and East Kent – let alone with their biggest fan, Aldershot and District. Was I dreaming – or did Smith’s eventually become Horseman Coaches of Reading? b) Was the sound of the mid-mounted engine too subdued for the driver to judge revs accurately enough for clean gear changing? c) Were the mechanical losses incurred by the double-reduction rear axle reflected in noticeably higher fuel consumption? Getting very technical here, Ian, but everything you say makes sense. The AH590 was not the AV590 and the vertical and horizontal 0.600 were not strictly the same engine. Dennis were always small and probably didn’t have the money to throw at solving problems of turning an engine on its side. [Even Volvo had to use government money. They piggy-backed development of B58 with horizontal engine on a government contract for military vehicles with similar layout. Otherwise Volvo may have been in with horizontal engines later than they were.] I’m no expert on early Dennises, but it was reported that the 06 was very smooth. As for the fuel consumption, if all else were right, people would perhaps have persevered. I heard that K4 Lances suffered twisted chassis at A&D, but I don’t know whether this was universal. At least they gave the general populous a Lodekker. Only very few horizontal O6 Dennis engines were 8 litres and with this engine there were reported problems of bearing failures from Glentons. The engine power was increased from the vertical engine by increasing the allowable revs and I am thinking that Glentons (on tour work) probably used this to advantage for long periods. The 7.6 litre horizontal engine does not seem to carry this stigma. All the horizontal engines differed from the vertical models – an oil way was drilled up the connecting rod to supply extra oil to the piston bores. I have often wondered if this was excessive and it robbed the bearing supply. I was based at RAF White Waltham, 1963 – 1967, and regularly used Smiths of Reading for Wednesday afternoon football fixtures. More importantly, Smiths had a daily contract to ferry our lovely WRAF personnel from RAF Shinfield Park where they were billeted, to RAF White Waltham, where they worked. The usual driver for this daily run was a veritable Mr Banks, who was 70 at the time, drove like a mad thing, and read my wife’s (to be) newspaper whilst driving if she sat near the front. Rumour has it that other, younger drivers were terrified of standing in for Mr Banks if he was away, as he would seek feedback on their behaviour and driving on his return. Sorry, this isn’t a technical item, but it might add a bit of whimsical history. Now, if anyone has a photograph of Mr Banks, with or without coach and WRAF beauties, that would be worth seeing. Good to read Pete Brant’s comment. I’m glad to say, Pete, that some of the old hands are still around. Sadly, it was Charlie Heath’s recent funeral that brought some of us together: I met Bunny Austin, Pete Smyth, Ron Shackleford (still working part-time for Horseman, Jim Foster and (though I didn’t get a chance to talk to him) Bert Newman. I think we ought to have annual reunions! 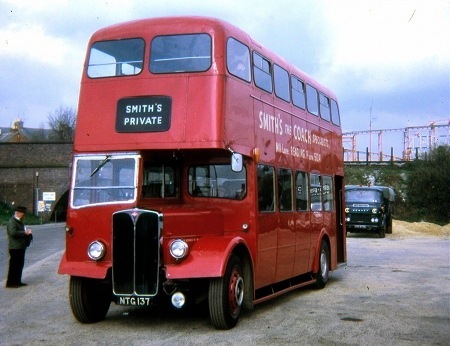 Very few Smith’s buses have survived: Ron S.’s Reliance, under cover at a museum east of Reading, is the only one I know of. I heard the other day that Dennis Lancet KJH 900, used for years as a towing wagon for preserved trolleybuses, hasn’t made it. 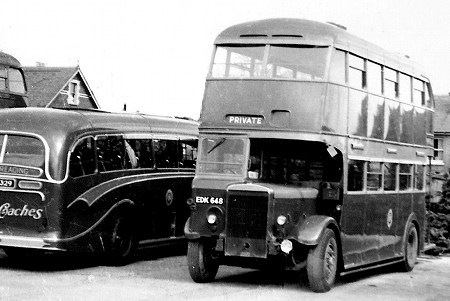 So the vehicles have all but gone and Rose Kiln Lane depot is built over, but–thank Heaven–some familiar faces are still around and Graham Low of Wokingham has plenty of photographs that he very foresightfully took in the 50s and 60s. Bunny Austin too has a collection of on-tour photos and apparently Jim Foster even has some cine-film. Hi Ian I also remembered the Rhonda Regents,the only vehicle you could bring up Southampton Street in top gear, due to low ratio gearbox, also was fitted with exhaust brake. Do you remember the old "ex Leeds Leyland JUG" we used on the Crowthorn Road Reserch contract during the construction. A couple of photos in connection with Pete Brant’s comment on Smith’s of Reading. JUG 624 (1946 Leeds PD1 but with 1945 chassis number) stands in St Mary’s Butts and JDP 519 (new to Smiths in 1953) which I used a lot when not on double-deck contracts, is in the yard, with one of the prewar London RTs in the background. Two JUGs (the numbers escape me) were always used on the "Paddy Run" to Crowthorne and were white with dust inside from the clothes of the always good-humoured Irish labourers, who’d regale each other with wonderful tales in the tradition of the roving story-tellers of rural Ireland. There was a stop on the way back at the Jack of Both Sides at Cemetery Junction, but in the n/s mirror you could always see a handful of thirsty chaps leaping off the platform well before you reached the pub. I worked this enjoyable run quite a lot, mostly with the late Mike Dare, who co-founded the Sandtoft Trolleybus Museum. You mention the good hill-climbing of the Rhondda Regent IIIs, Pete. I wonder whether that was also because of the 9.6-litre engine and lightweight bodywork? Len Ledger was the driver and guardian of London RT FXT 229, and you had to be on your best behaviour to be allowed to drive it! So many wonderful memories Ian, on many occasions I was privileged to drive Lens RT with the coconut matting on the cab floor for those dirty people that didn’t remove their shoes before entering the cab. I was so sorry to hear of Charlie Heaths passing, glad to hear Ron Shack is still doing a bit, Tell him "Herman the German was asking after him. Do you know if Mick Smith "the Govenor’s Son" is still with us,? I last saw Keith Aplin at Horsemans a few days before he retired. It was wonderful to read your comments about Smith Coaches. My father is Jim Avenell who is still with us at 80yrs young. I spent my childhood either down the yard or out in the coach with my father during the early to mid sixties and in the social club between runs lol, I was always there. Saturday mornings would be spent emptying the ash trays and polishing them with Duraglit while dad was on the wash in his wellies doing the outside, we’d then go up to the canteen for a cuppa and I would sit in ore listening to all the guys talking and joking around, the room full of smoke from woodbines and parkdrive, plenty of tea. Then back down to the wash and polish the body trims, oh I loved it. We used to keep a pony on the grass behind the social club and people would feed it beer and crisps through the window, never forgetting the Christmas parties for us kids, Happy days sitting up front going to Harwell sitting in the shed on site, or going to Abingdon cattle market. One day we bought a dozen chicken and brought them back to Reading in the boot lol Oh so many stories. I have amassed a couple of hundred photos over the years and always looking for more or any thing related. Some of the guys I remember were great, guys like Robby Curtis, Ron Shack of course, Dave doe, Jack Pit, Reggy Summerfield,Grover,Steel,Kenny Haywood,Punchy Parsons,Chris Denton,Mick Goslin, Pete Fisher, Morri Hood, Ceral Gollop, Ropper, Dave Reed, Gorge Forman, Alf, Michal and Jacky Smith. Im sure I could think of more. So many good memories and all that’s left is the row of conifers that lined the wash. I myself later drove for Horsemans briefly before getting my class one HGV, Later to become an HGV driving assessor, so I guess you could say its in the blood and the seeds where sown down at Smiths Luxury Coaches. 9797 DP a Val 14 Duple is still with us!